Getting in a complete suit is, unfortunately, pretty uncommon here at Clementine. We get in great blazers, and great dress pants, but seldom a complete set. A recent drop off has us seeing a couple of really great suits in the store. Most are new with tags! 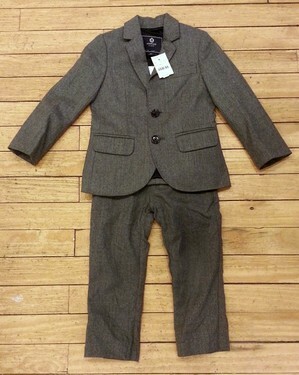 New with tags, wool suit by Crewcuts. Beige cotton suit by Crewcuts. Unfortunately, this is 100% matching since the pants and jacket are different sizes. They would still go together great, though! The perfect coat to go over a suit. Grey, wool coat by Crewcuts.